Working with social media is stressful. There’s no denying it. You have to share posts, deal with complaints, interact with your audience, and everything in between. Being a social media manager is being several things at once, and naturally, stress will soon follow. You have a million things to think about, and you’re trying to juggle a thousand things at once. Inevitably, social media will become stressful eventually. But the truth is that it doesn’t have to be stressful. At least not at the degree that many social media managers are feeling. With the help of some clever tactics, and with great planning, social media can generate amazing results for you, while your stress level is at an all-time low. In this article, we’re looking at 6 Clever Ways To Make Social Media Marketing Less Stressful. Negative reviews and disgruntled customers take a lot of effort, and they are also harming your brand if not dealt with in the right way. 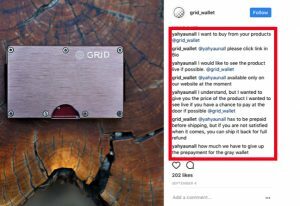 unfortunately, I regularly come across brands on social media that doesn’t deal with their customer complaints in the right way, and the results are devastating. Their customers are only getting angrier and angrier. Let’s begin by looking at the things you shouldn’t do with your customer complaints on social media. If you aren’t aware of the actions that harm you when you deal with your customer complaints on social media, there’s a big risk that you might be doing them over and over again – making your customers even angrier than they are. If you’re receiving complaint comments on your posts, the worst thing you can do is to delete the comment. In desperation, some marketers take this action in fear of everyone else seeing it, but the truth is that it can actually help you if you deal with it the right way. When you delete a comment from an angry customer, you’re only going to make them angrier. When you delete their message, you’re sending signals that you have no intention of helping them, and you show them that you don’t care about them a single bit. However, if you can respond to the complaint in a good manner, offering a solution, and doing everything in your power to make things right, you show them that they are important to you and that you care deeply about their satisfaction. In fact, if you succeed in resolving a complaint in the customer’s favor, they’ll do business with you 70% of the time. In contrast, 91% of unhappy customers will not willingly do business with you again. 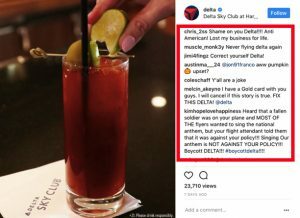 Delta Airlines receives a ton of complaints on their Instagram page. They don’t delete the complaints, but they don’t respond to them either. When you receive a complaint, you shouldn’t see this as something negative, and instead, see it as a potential to show your amazing customer service. If people see a complaint from a customer on your page, and then see that you have been able to turn that customer into a happy one again, their trust in you will increase, because they’ll understand that you are genuinely passionate about giving your customers a great experience – even though something goes wrong on the way. Lastly, having complaints will humanize your brand, because everyone knows that no business is perfect, and by having angry customers, and then being able to solve the problem in their favor, people will know that they can trust you. Don’t stress about customer complaints. You’ll only waste energy and find social media marketing more stressful. Instead, have a clear guide that tells you exactly how you’re going to deal with complaints in order to make the disgruntled customer into a happy one. Hate on social media is unfortunately not too uncommon. And it takes a lot of energy from other things to deal with it. If the hateful comments and messages continue, it will also lead to stress. The difference between hate and complaints is that complaints actually have a base for what it is they are writing, and when you are trying to identify the two, it is very important that you are careful with sorting, because deleting a comment that was a complaint and not just hate, can lead to the things that we just talked about above. Celebrities often receive hate for no reason on social media, but so do brands. Ask yourself, does what this person us saying actually have any value and truth to it? It’s important that you aren’t too quickly with sorting out messages that can be seen as “hate” because there might actually be a reason to what it is they are saying. Messages that aren’t just plain hate can actually be quite valuable to brands because they can give you insight into things you need to improve and do better. But if you are seeing the same person over and over comment hateful messages without any basis or truth to it, make sure you block them, because they will only be stealing your energy in the desperation of getting attention. If they do, however, hold truth, try to solve the problem that caused their anger, and show that you are doing everything you can to make things right again. Instead, they were able to answer all the customer’s questions and make them happy. Potentially also buy from them. This is the most obvious solution to a stressful social media marketing where it feels like you are always running short of time. Social media is time-consuming and there’s no denying it. If you don’t have enough resources to manage your social media, you are missing out on great opportunities to impact your audience because you’re not reaching your full potential. A social media manager is a lot of things, but they shouldn’t be everything. When you are trying to do too many things at once, you’ll only end up doing an average job on all of the things, instead of doing a superior job on a few things. Therefore, you want to make sure you have the right team, the people with the right knowledge and experience, and most importantly, enough people, that can take care of the different aspects of social media marketing. 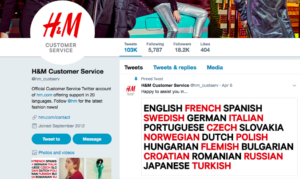 H&M, for example, has a Twitter account solely dedicated to customer service. This is to take some workload off their main social media managers in the form of customer inquiries and complaints and at the same time be able to provide better service for the customers. Tools are extremely helpful when working with social media. The best part is that there are a ton of them! There are literally tools for every single part of the social media marketing journey, and as a social media marketer, you should have a heavy toolbox that helps you get things done in a quicker and more effective way, and that releases stress off of your shoulders. To prevent yourself from burnout, consider building up the size of your toolbox to streamline your social media activity all in one place. Look at tools that will help you schedule and optimize your content, while also helping you evaluating and measuring the results of your efforts. Identify the things that are making you the most stressed, and find tools that will make your job with it easier. Normally, it’s not the whole social media marketing journey that is stressful, but more certain parts about it. This means that you don’t necessarily need a tool for every single part of social media there is to use, because this, in turn, can lead to stress of keeping track of all the tools you’re using, rather than working with achieving social media results. However, if you think that you’ll benefit from using them all, then go ahead, I am not stopping you! There’s a reason to why I think it’s so important to have a social media strategy. And I am not alone on this point. It’s a lot easier to know where you’re going and how you’re going to get there when you have a map, right? Many of the marketers I ask that feel like social media is granting them a lot of stress often respond that they don’t have a social media strategy in place, or at least not a very thorough one. 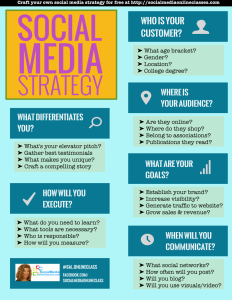 Having a thorough social media strategy is one of the biggest stress-relievers of them all. When you have a map that guides you with your decisions and tells you what you should do, it will be a lot easier to reach success. Fail to implement one, and your social media results will suffer. Or, even more importantly, your stress-levels will fly through the rough. The more thorough your social media strategy is, the better, but this, of course, can demand some time. And as a stressed social media manager, it might be the time that you don’t have. But creating a social media strategy is well-worth the investment because it will remove a lot of stress in the long-term. The best part is that your social media strategy has a long life, and only needs to be tweaked after some time in order to stay relevant. The hour or two it takes to create your strategy is something that you won’t regret afterward, considering how much it will help you. If you are short on time, you can begin by including the most important parts and asking the most crucial questions. This will allow you to look back at your strategy, and make decisions that align with your main objectives with social media. Social media is a stressful landscape, there’s no doubt about it. Your customers demand you to be online 24/7 but you only have so much time. There are many time thieves on social media, and what is initially planned to be a 10-minute social media check can quickly turn into an hour of scrolling and interacting. There are things to look at on social media so that it is enough and gets left over. To avoid burnout and to be more productive, there are drastic changes you need to make today. These changes can save you time and make you work more efficiently – while also generating better results as a whole.